The University of California, Santa Cruz, has received a $157,000 grant from the Sunlight Foundation to support Metavid-an online, open-source archive of U.S. House and Senate proceedings created last year by two graduate students and hosted by the campus. The award was among a round of grants totaling $267,000 that the foundation has distributed to advance the goal of transparency and openness in Congress. "The groups we are helping to fund are on the cutting edge of web 2.0 technology and are among the best at using the Internet to strengthen democracy," noted Ellen Miller, Sunlight's cofounder and executive director. 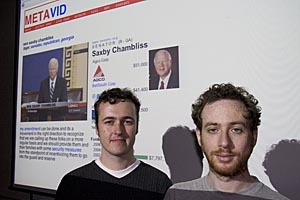 Metavid was created by Michael Dale and Abram Stern last year as their thesis project in UC Santa Cruz's new Digital Arts and New Media (DANM) graduate program. Using public domain video feed from C-SPAN, Metavid makes video archives of congressional floor proceedings on the web, searchable according to who said what, and indexed, so that users can easily link to any moment of dialogue. 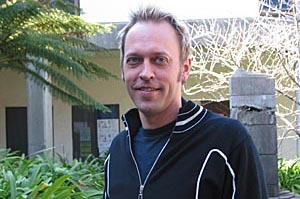 "We anticipate that Metavid will be a vital media resource for journalists and citizens as they reflect on the records of candidates for the 2008 elections," said UC Santa Cruz associate professor of film and digital media Warren Sack, who wrote the grant application with his two former graduate students. "The Metavid web site will make it possible for anyone to publicly comment on the words and images of our senators and representatives as well as reuse this video footage in their own media productions." The students built their own computers for the project to meet the tremendous storage needs of the archive--which requires space to record up to 16 hours of video a day, five days a week. They use free software and the Linux open-source operating system to make the project universally adaptable. "Metavid won't just be a one-way conversation with "read-only" access to the politicians' rhetoric," said Dale, who will now work on the project full-time with Stern over the next year. "By embracing cutting-edge web technologies, it is instead a platform for people to use the footage and data in a digital dialogue about presidential candidates." "This could include posting clips to their blog, and adding their own commentary and links to other videos or documents." Dale added. "Or they could combine voting history, campaign contributions, spoken transcripts, and video feeds into a critical or supportive mashup of a candidate's positions on a particular issue." The archive is a prime example of what can be accomplished in the emerging field of public media. Like Wikipedia, the popular communal online encyclopedia, Metavid has been designed as a nonpartisan open-source web site that applies innovative technology and art for the public good. "It's about opening up access to the public," said Dale. "It shouldn't take a multimillion-dollar corporation to do that anymore."